Princessly Polished: Haul: What else arrived over the weekend! Milani 3D Holographic polishes in HD, Hi-Tech, Hi-Res, Digital, and Cyberspace. 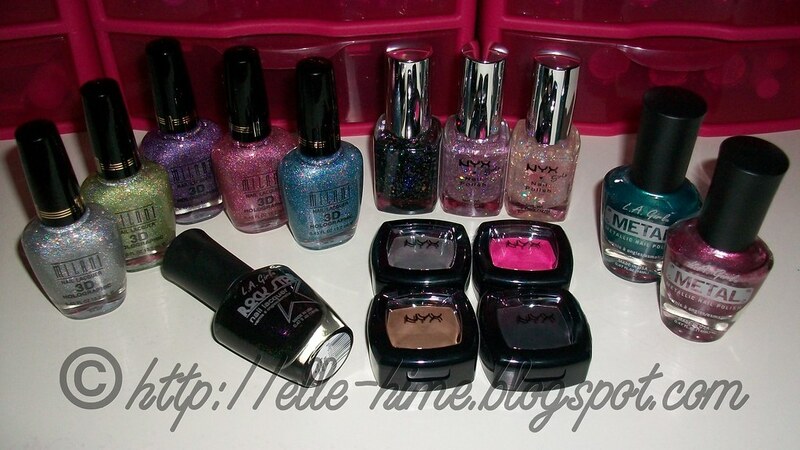 Nyx Girls polishes in Frizz Spots, Dynamic Glitter, and Dreamy Glitter. La Girl polishes in Rockstar, Chromium Green, and Pink Steel. And Nyx Single Eyeshadows in Dark Gray, Jazzy Pink, Dark Brown, and Black. I could not resist the Milani polishes. This is a brand that I have not found in stores locally yet. After missing out on them in a giveaway (which reminded me of their existence) I just went ahead and bought them - totally worth it! The Nyx polishes have more expensive dupes right within the same brand. I have no clue if it's worth springing for the Salon Formula... I just went with these little cuties. LA Girl Rockstar is an awesome black polish with tiny purple-to-green flakies in it. The other two La Girls are foil colors! The single eyeshadows are all matte. Jazzy Pink is constantly sold out and I was so happy to finally snag it. I grabbed the neutrals to use as eyeliner for the most part. Besides sharing these pretties with all of you, I share their use with my family. My grandmother is in constant benefit of my stash of nail polish, and when my Mom saw these she tried on a few colors. Really, I prefer it that way! A bottle of polish lasts me quite awhile and I feel better knowing they will all get used... So long as no one has nail rot I'm cool with sharing. Anyone else have the same policy? NYX polishes are so pretty! Milani is everywhere in drugstores, but I haven't seen those NYX beauties in my city. I buy my Nyx Online because they are nowhere nearby... Definitely will post up pics of them when I have time! Those Milani's are some of my favorites!